The tour with the Felice Brothers ended in Ohio and after 2 months away we were understandably a little desperate to get home. Jen flew out early the next morning to join another tour in Europe and Omar, Matt, and I started the 2500 mile drive home. We tried to do it in one go, stopping only for gas and coffee but as many of you know the drive ended a little prematurely on an embanked divider of a barren stretch of highway 80 near Rawlins, Wyoming. The sun had just come up over the when we drove over black ice, slid into the embankment and flipped multiple times, leaving Omar with a broken finger, a fractured vertebrae and, as you can see by the pictures, the extreme fortune of not being paralyzed. I was in the back, asleep on one of the benches and got out with a severely dislocated shoulder, 80-90% damage to my axillary nerve, the subscapular nerves, and other offshoots of the Brachial Plexus. Matt, in what in my opinion can only be attributed to his casual fatalism, walked away with a small cut on his hand. 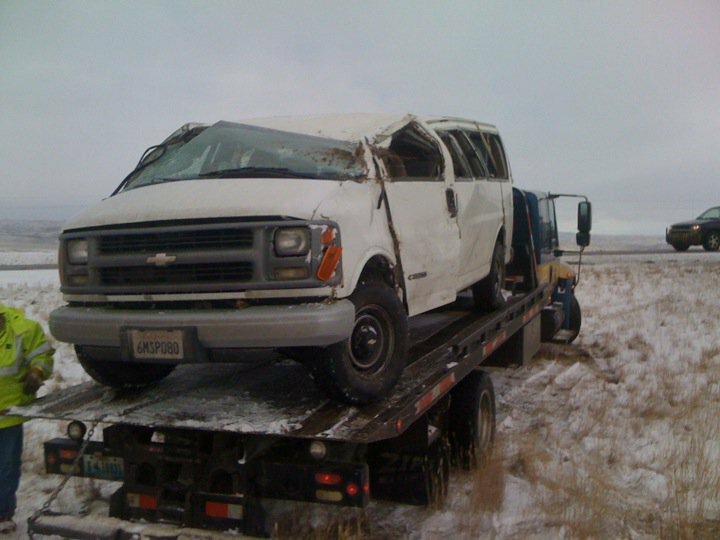 As you can see from the pictures, the van which I bought about a month before tour, will never ride again. Everyone was extremely kind to us at the Memorial Hospital of Carbon County in Rawlins, WY. Of the 8,000 people in that town two of them turned out to be friends of friends of friends who caught wind of our accident and went far beyond what could be expected of practical strangers in helping us out. They brought us food, drinks, entertainment, let Matt sleep at their house two nights, and after finally being released from the hospital, drove us the two hours to the closest airport. Our gear is currently still in their basement. So after that two hour drive to Rock Springs, WY, an extremely turbulent flight over the Rockies into Salt Lake City, 7 hours waiting in the SLC Airport only to find out that our flight was delayed until the next morning, we snuck onto a flight to Sacramento, which touched down around midnight where Omar’s Dad went way out of his way to pick us up, drive us back to the city, and likely not return to his own home in the east bay until some time early the next morning. Somehow we made it home in time for Thanksgiving. Needless to say, we had plenty of thanks to give. From complete strangers on the side of highway 80 to the friends and family who have helped us throughout our recovery, we are extremely grateful. On top of those already mentioned I would like to thank Sadie Short for creating a band aid site to help raise funds to pay off some of our bills, which we continue to accrue; and my close friends and family for for being so supportive. I would like to thank Omar, Matt, Jen, Ephriam, and Moses for their invaluable contributions to this past tour. I would also like to thank everyone who came out to see us across the country, and everyone who has sent us wishes towards a speedy recovery. Your presence has been felt. I’ve only picked up a guitar once or twice since that last show in Columbus. Most of the damage was to my rotator cuff which makes reaching the length of the neck a little challenging. Partially for that reason and others, this so called “solo” project is going to be on hold for a little while. My other band TWO GALLANTS is planning a show in SF in April and a few little tours this summer. So stay tuned for that. Be good to yourselves and one another.